Many BankruptcyWatch clients have already moved completely away from using PACER. These enhanced notifications allow companies to further reduce, and in many cases completely eliminate, the mind-share that is required to deal with new bankruptcies. “In 2017, we expect our clients to move completely beyond the concept of individual bankruptcy notifications. Imagine arriving at work and seeing a single notification that your company’s bankruptcy work has already been completed for the day. That’s now possible with BankruptcyWatch.” said Wickham. Increased Staff Efficiency. Cut payroll costs and shift the focus to making sound decisions instead of mindlessly entering data or wasting time searching for documents in each case. Reduced Risk. Because the data is electronically gathered directly from the court system using the BankruptcyWatch PACER API, there is less risk of staff missing an important detail or making a mistake in the data entry process. Customizable Data. With literally thousands of available data points, BankruptcyWatch makes the relevant information easily accessible in every case. Multiple Notification Methods. BankruptcyWatch clients can now receive notifications and data via API call and text message (SMS) in addition to the industry standard email method. This allows for automated file updating and workflow advancement as well as more instant reactions by agents in the field. BankruptcyWatch announces their PACER.gov monitoring tool called PacerUpTime.com. PacerUpTime.com allows any organization or individual to track the current and prior status of federal bankruptcy court website availability. PACER.gov is the US government’s electronic court records repository and consists of data from 94 different court districts. Because PACER.gov pulls from so many sources, it is surprisingly common for one or more data sources to be unavailable at any given time. “Not knowing if a particular district is at fault or some other problem prohibits access to certain bankruptcy courts can be a real challenge for organizations such as banks, loan servicing companies and underwriters.”, says Jonathan Turkanis, VP - Software Architecture. This is especially true if those organizations utilize automated means of access to PACER information such as the BankruptcyWatch PACER API. PacerUpTime.com tracks the availability of all 94 of the federal bankruptcy court websites. 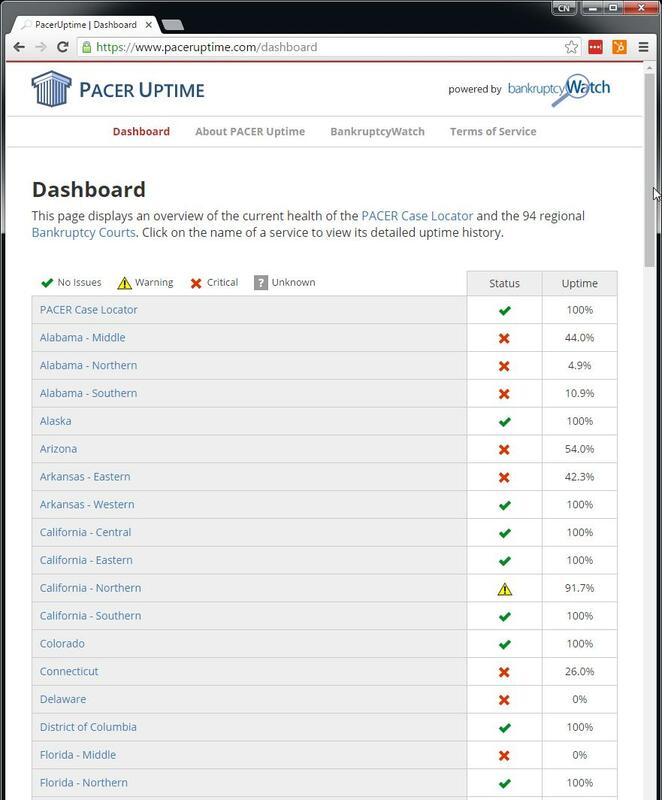 PacerUpTime.com provides some unique elements including a quick and easy overview of every district as well as a more in-depth view that helps users understhand the severity and type of issue the system is experiencing. BankruptcyWatch is the industry leader in providing automated access to bankruptcy court data, including information contained inside PDF documents. For more information on how to automate your bankruptcy department or how PacerUpTime.com works, email Sales@BankruptcyWatch.com, visitwww.BankruptcyWatch.com or call 888-895-1328.